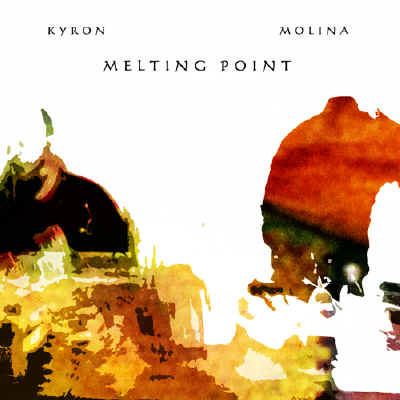 On April 3, 2007 Kyron and David Molina performed at Melting Point Gallery in San Francisco, California. Together, they improvised a live film score for Susana Aragon's short film "Personal Luggage". Using electronic software and acoustic improvisation, Kyron and Molina pieced the minimalist score together moment by moment, creating an ideal compliment to the film. Mirrors were placed in front of the two performers so that they could see the images as they were projected onto the screen behind them and respond musically to what they saw. water phone, water Kalimba, water spring machine, mini tabla and electric guitar, as well as some unique instruments of his own creation. Kyron processed the sounds as David played them, expanding, contracting, morphing, looping and re-mixing them, combining them with electronic drones and beats, creating a complex thick instrumental web. During the following year, Kyron took the raw recordings of that night and produced multiple re-mixes, variations and tangential explorations. Melting Point is an audio artifact from that night of audiovisual experimentation and a collection of the musical explorations that developed from it. Both elements are woven together to form a continuous aural experience. For over 12 years, David Molina has been composing, performing scores, and designing sound for theatre, dance, film, installation, radio and multimedia productions. He tours and performs extensively with the experimental, electro-acoustic band Transient, based in San Francisco. Native to El Salvador, Kyron aka JC Mendizabal is a composer and electronic musician willing to explore a wide range of musical genres. His experiments with improvisation and noise influenced electronic compositions have led to the release of a large number of titles over the last 15 years, all of which are available through the Black Note Music label. "...hypnotic states of mystic beauty and magical scenes of natural presence."